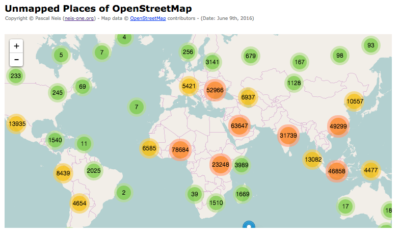 Back in June we had a twitter chat about potential new features for the “How did you contribute to OpenStreetMap” (HDYC) website. One suggestion was to “show more relevant information about skills, tagging system or the quality of contributions” of a project member (by J-Louis). Overall I really like the following summary by Claudius: “HDYC started off with a strong focus on quantitative metrics and you expanded it lately a lot to reflect the qualitative nature of contributions. I think there’s value to show more about which area of data someone contributed: Auto/bike/railway/water infrastructure, amenities…”. Vandalism is (still) an omnipresent issue for any kind of open data project. 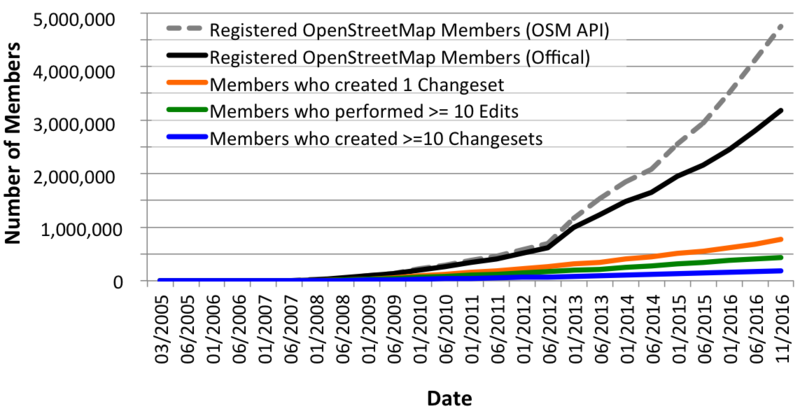 Over the past few years the OpenStreetMap (OSM) project data has been implemented in a number of applications. In my opinion, this is one of the most important reasons why we have to bring our quality assurance to the next level. Do we really have a vandalism issue after all? Yes, we do. But first we should take a closer look at the different vandalism types. 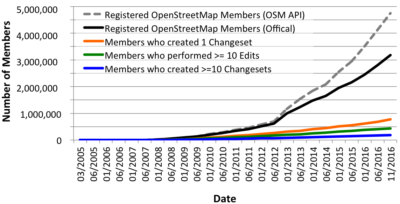 Over the past few years I have written several blog posts about the (non-) activity of newly registered OpenStreetMap (OSM) members (2015, 2014, 2013). Similarly to the previous posts, the following image shows the gap between the number of registered and the number of active OSM members. Although the project still shows millions of new registrations, “only” several hundred thousand of these registrants actually edited at least one object. Simon showed similar results in his yearly changeset studies. Use every place node of the OSM dataset which has a village-tag (place=village). Search in a radius of ca. 700 m for a street with one of the following highway-values: residential, unclassified or service. If no street can be found, mark the place as “unmapped”! My results for the entire OSM planet can be found under the following webpage. The reputation of a contributor in OpenStreetMap (OSM) plays a significant role, especially when considering the quality assessment of the collected data. Sometimes it’s difficult to make a meaningful statement about a contributor by simply looking at the raw mapping work represented by the number of created objects or used tags. Therefore, it would be really helpful if we would have some additional information about the person who contributes to the project. For example: Does she/he help other contributors? Is her/his work somehow documented or based on one of the “discussed” proposals? Or does she/he work as a lone warrior in the OSM world? 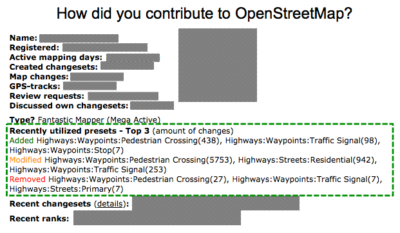 In 2010 I created “How did you contribute to OpenStreetMap?” (HDYC) as a kind of fun side project. Nowadays many people use it to get some detailed information about OSM contributors. Some of you are probably familiar with the “verified” icon used on some celebrity Twitter accounts. I created a similar new feature for the aforementioned HDYC page. If you connect your related OSM accounts, your profile will be marked as “verified”. How to detect suspicious OpenStreetMap Changesets with incorrect edits? Last year we wrote a journal paper in which we analyzed the OpenStreetMap (OSM) dataset of the United States which was published on May 28th, 2013 in the Transactions in GIS Journal. You can download a free pre-print version here. This paper has been published just on time to add to the discussion at the upcoming State of the Map United States conference which will take place in San Francisco and includes some presentations about data imports to OSM. Unfortunately, Dennis and I cannot attend the conference this year, so we decided to write a blog post with some additional and up-to-date numbers. The last unmapped places analysis for OpenStreetMap that I conducted is nearly eight months ago. So I figured it was about time to create a new one. You can read in the last blog post how my algorithm exactly works. First of all, sorry that I did not create a new stat regarding the Routing View past month. To all the new readers: Usually I create an analysis about the Routing View of the OpenStreetMap Inspector for each month for Europe. You can find more information about the OSM Inspector (OSMI) here. The Routing View within the OSMI “shows problems in the data related to routing and navigation”. You can read more about it here … A direkt link to the OSMI Routing View is here! Recently some new posts on the German OpenStreetMap-Mailing-List regarding the coverage of yet undetected regions in OpenStreetMap have been accumulating, caused by the current clearance of the BING-aerial images. In one of my former blog posts that I wrote back in August this year, I introduced an analysis that included the search for “places” such as small villages etc. in Germany that probably had not been mapped in OSM at that time (the post in German language can be found here).